You all know that the field of machine learning keeps getting better and better with time. Predictive models form the core of machine learning. Better the accuracy better the model is and so is the solution to a particular problem. In this post, you are going to learn about something called Ensemble learning which is a potent technique to improve the performance of your machine learning model. How it improves the performance of a machine learning model? 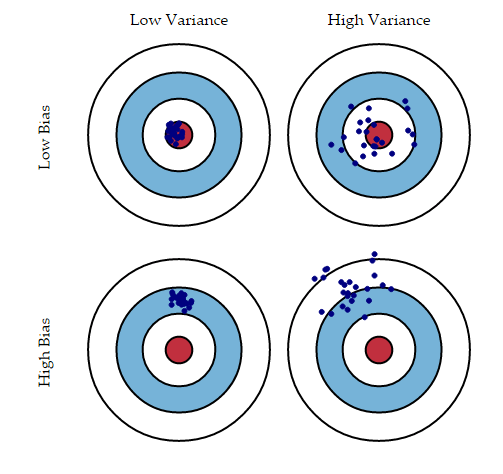 In the world of Statistics and Machine Learning, Ensemble learning techniques attempt to make the performance of the predictive models better by improving their accuracy. 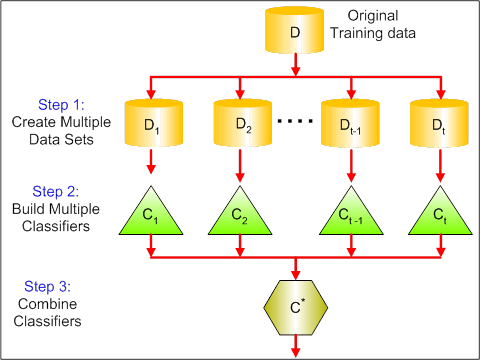 Ensemble Learning is a process using which multiple machine learning models (such as classifiers) are strategically constructed to solve a particular problem. Let's take a real example to build the intuition. Employee of Company XYZ: This person knows the internal functionality of the company and has the insider information about the functionality of the firm. But he lacks a broader perspective on how are competitors innovating, how is the technology evolving and what will be the impact of this evolution on Company XYZ’s product. In the past, he has been right 70% times. Financial Advisor of Company XYZ: This person has a broader perspective on how companies strategy will fair in this competitive environment. However, he lacks a view on how the company’s internal policies are fairing off. In the past, he has been right 75% times. Stock Market Trader: This person has observed the company’s stock price over the past 3 years. He knows the seasonality trends and how the overall market is performing. He also has developed a keen intuition on how stocks might vary over time. In the past, he has been right 70% times. Employee of a competitor: This person knows the internal functionality of the competitor firms and is aware of certain changes which are yet to be brought. He lacks a sight of the company in focus and the external factors which can relate the growth of competitor with the company of subject. In the past, he has been right 60% of times. Market Research team in the same segment: This team analyzes the customer preference of company XYZ’s product over others and how is this changing with time. Because he deals with customer side, he is unaware of the changes company XYZ will bring because of alignment to its own goals. In the past, they have been right 75% of times. Social Media Expert: This person can help us understand how has company XYZ has positioned its products in the market. And how are the sentiment of customers changing over time towards the company? He is unaware of any kind of details beyond digital marketing. In the past, he has been right 65% of times. Given the broad spectrum of access you have, you can probably combine all the information and make an informed decision. The assumption used here that all the predictions are completely independent is slightly extreme as they are expected to be correlated. However, you can see how we can be so sure by combining various forecasts together. Well, Ensemble learning is no different. An ensemble is the art of combining a diverse set of learners (individual models) together to improvise on the stability and predictive power of the model. In the above example, the way we combine all the predictions collectively will be termed as Ensemble learning. Moreover, Ensemble-based models can be incorporated in both of the two scenarios, i.e., when data is of large volume and when data is too little. There can be difference in the population of data. There can be a different modeling technique used. There can be a different hypothesis. Imagine that you are playing trivial pursuit. When you play alone, there might be some topics you are good at, and some that you know next to nothing about. If we want to maximize our trivial pursuit score, we need to build a team to cover all topics. This is the basic idea of an ensemble: combining predictions from several models averages out idiosyncratic errors and yield better overall predictions. The following picture shows an example schematics of an ensemble. In the picture above, An input array X is fed through two preprocessing pipelines and then to a set of base learners f(i). The ensemble combines all base learner predictions into a final prediction array P.
Now, the important question is how to combine predictions. In the trivial pursuit example, it is easy to imagine that team members might make their case and majority voting decides which to pick. Machine learning is remarkably similar in classification problems: taking the most common class label prediction is equivalent to a majority voting rule. But there are many other ways to combine predictions, and more generally you can use a model to learn how to combine predictions best. 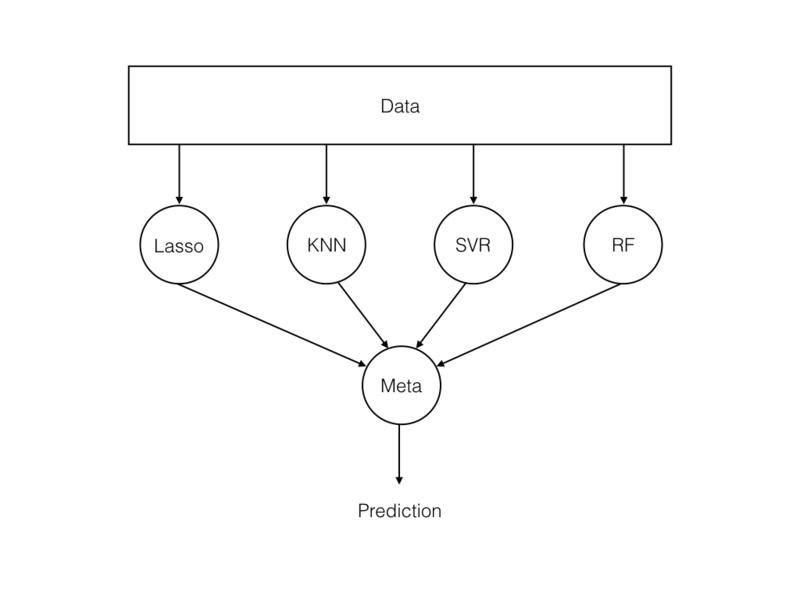 Here, Data is fed to a set of models, and a meta-learner combine model predictions. Why is this important in the current context? To understand what goes on behind an ensemble model, you need first to know what causes an error in the model. You will briefly get introduced to these errors. Bias error is useful to quantify how much on an average are the predicted values different from the actual value. A high bias error means we have an under-performing model which keeps on missing essential trends. Typically, as you increase the complexity of your model, you will see a reduction in error due to lower bias in the model. However, this only happens until a particular point. As you continue to make your model more complex, you end up over-fitting your model, and hence your model will start suffering from the high variance. Although there are several types of Ensemble learning methods, the following three are the most-used ones in the industry. Bagging is one of the Ensemble construction techniques which is also known as Bootstrap Aggregation. Bootstrap establishes the foundation of Bagging technique. Bootstrap is a sampling technique in which we select “n” observations out of a population of “n” observations. But the selection is entirely random, i.e., each observation can be chosen from the original population so that each observation is equally likely to be selected in each iteration of the bootstrapping process. After the bootstrapped samples are formed, separate models are trained with the bootstrapped samples. In real experiments, the bootstrapped samples are drawn from the training set, and the sub-models are tested using the testing set. The final output prediction is combined across the projections of all the sub-models. Boosting is a form of sequential learning technique. The algorithm works by training a model with the entire training set, and subsequent models are constructed by fitting the residual error values of the initial model. In this way, Boosting attempts to give higher weight to those observations that were poorly estimated by the previous model. Once the sequence of the models are created the predictions made by models are weighted by their accuracy scores and the results are combined to create a final estimation. Models that are typically used in Boosting technique are XGBoost (Extreme Gradient Boosting), GBM (Gradient Boosting Machine), ADABoost (Adaptive Boosting), etc. 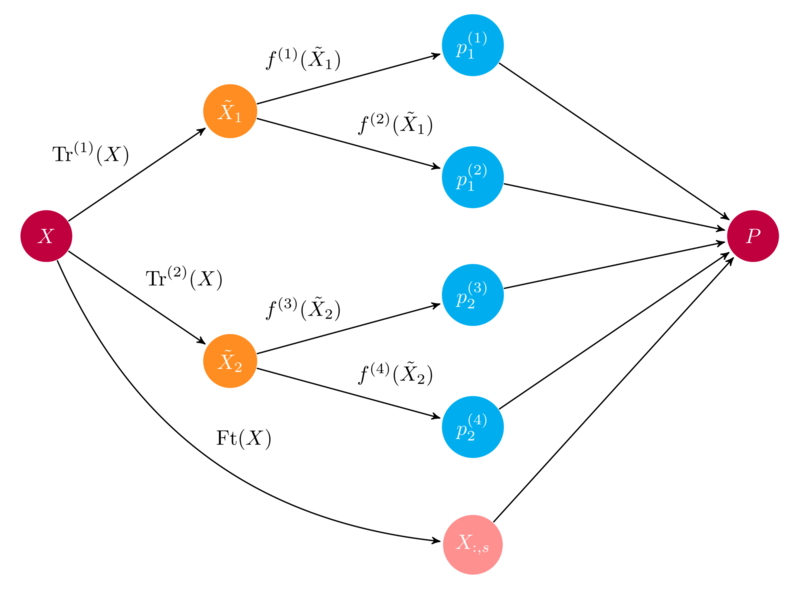 Voting is one of the most straightforward Ensemble learning techniques in which predictions from multiple models are combined. The method starts with creating two or more separate models with the same dataset. Then a Voting based Ensemble model can be used to wrap the previous models and aggregate the predictions of those models. After the Voting based Ensemble model is constructed, it can be used to make a prediction on new data. The predictions made by the sub-models can be assigned weights. Stacked aggregation is a technique which can be used to learn how to weigh these predictions in the best possible way. Well, the time has come when you apply these concepts to strengthen your intuition and confidence. Let's do it in Python. The dataset you are going to be using for this case study is popularly known as the Wisconsin Breast Cancer dataset. The task related to it is Classification. The dataset contains a total number of 10 features labeled in either benign or malignant classes. The features have 699 instances out of which 16 feature values are missing. The dataset only contains numeric values. The dataset can be downloaded from here. You will implement the Ensembles using the mighty scikit-learn library. Let's first import all the Python dependencies you will be needing for this case study. Let's load the dataset in a DataFrame object. As mentioned earlier, the dataset contains missing values. The column named "Bare Nuclei" contains them. Let's verify. You can spot some "? "s in it, right? Well, these are your missing values, and you will be imputing them with Mean Imputation. But first, you will replace those "? "s with 0's. The "? "s are replaced with 0's now. Let's do the missing value treatment now. Now if you take a look at the dataset itself, you will see that all the ranges of the features of the dataset are not the same. This may cause a problem. A small change in a feature might not affect the other. To address this problem, you will normalize the ranges of the features to a uniform range, in this case, 0 - 1. You have performed all the preprocessing that was required in order to perform your Ensembling experiments. You will start with Bagging based Ensembling. In this case, you will use a Bagged Decision Tree. You have imported the dependencies for the Bagged Decision Trees. Let's see what you did in the above cell. First, you initialized a 10-fold cross-validation fold. After that, you instantiated a Decision Tree Classifier with 100 trees and wrapped it in a Bagging-based Ensemble. Then you evaluated your model. You model performed pretty well. It yielded an accuracy of 95.71%. Brilliant! Let's implement the other ones. In this case, you did an AdaBoost classification (with 70 trees) which is based on Boosting type of Ensembling. The model gave you an accuracy of 95.57% for 10-fold cross-validation. Finally, it's time for you to implement the Voting-based Ensemble technique. You implemented a Voting based Ensemble model where you took Logistic Regression, Decision Tree and Support Vector Machine for voting purpose. The model performed the best so far with an accuracy of 96.42% for 10-fold cross-validation. Now, let's get you familiarized with some common pitfalls of Ensemble learning. In general, it is not true that it will always perform better. There are several ensemble methods, each with its own advantages/weaknesses. Which one to use and then depends on the problem at hand. For example, if you have models with high variance (they over-fit your data), then you are likely to benefit from using bagging. If you have biased models, it is better to combine them with Boosting. There are also different strategies to form ensembles. The topic is just too broad to cover it in one answer. But the point is: if you use the wrong ensemble method for your setting, you are not going to do better. For example, using Bagging with a biased model is not going to help. Also, if you need to work in a probabilistic setting, ensemble methods may not work either. It is known that Boosting (in its most popular forms like AdaBoost) delivers poor probability estimates. That is, if you would like to have a model that allows you to reason about your data, not only classification, you might be better off with a graphical model. 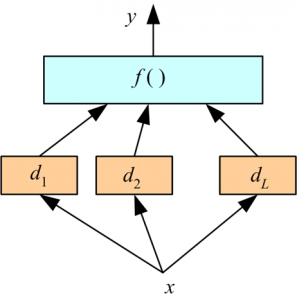 So, in this post, you got introduced to Ensemble learning technique. You covered its basics, how it improves your model's performance. You covered its three main types. Also, you implemented these three types in Python with the help of scikit-learn, and in this course of action, you gained a bit of knowledge about the necessary preprocessing steps. That's quite a feat! Well done! In this final section, I suggest some further undertakings on Ensembles which you might want to consider. Try other Boosting-based Ensemble techniques viz. Gradient Boosting, XGBoost, etc. 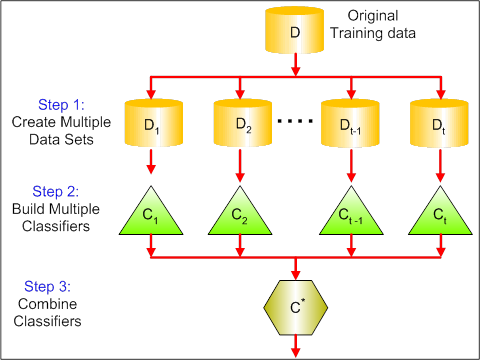 Try Ensemble learning on a variety of datasets to understand where you should and where you should not apply Ensemble learning. For finding datasets Kaggle, UCI Repository, etc. are good places to search. I hope you enjoyed this tutorial. Let me know your doubts (if you have any) in the comments section. If you are interested in learning more about Ensemble's in Machine Learning, take DataCamp's Machine Learning with Tree-Based Models in Python course.